Well here comes a new Axxis album, after the rather medium album Eyes Of Darkness, an album I did judge too lightly (and probably over quoted by 10 points too). An album which proven to be a dust keeper except for the perfect title track, which let's face it is probably Axxis' best song to date. That said, it was with anticipation but with some reserve too that I've inserted the CD into the player, half expecting to be disappointed. Oh boy, what a surprise... Santa was indeed early this year, first Heavenly and now Axxis ! And we have a winner. The album starts with a moody intro, followed by the opener song Angel Of Death, a pure sonic and melodic deflagration like only Axxis could deliver. But the funny thing is that Axxis has always been, more or less, hard rockers (with more than one edge I might add). This song sounds more like True Metal than Hard-Rock, and I think that this is most due to the new production. This is what I call crystal clear, powerful and in your face production. So after getting attuned to the new sound of Axxis, I was quickly slapped with an incredibly melodic chorus, epic to the bones (and with the nice welcome addition of choirs throughout the song). It sure sounds different, and more sharp, but it also sounds 100% pure (and not rough) Axxis !!! That's probably what I like most with this band, is that many albums are rather different in style (Kingdom Of The Night, The Big Thrill, Matters Of Survival,...) while still keeping that very personal Axxis feel. For sure the vocals of Bernhard Weiss (one of the best singer on the face of this planet if you ask me) weight heavily in the balance and are what brings that unmistakable originality to the band. At this point, I was really eager to listen to the next song... and Time Machine is one of Axxis most melodic and catchy song to date. Once you've listen to the chorus, it will forever grave itself into your neuronal clusters. But this song is also crunchy (guitar wise) and a definite head-banging experience. The wonderful guitar solos and melodies à la Back To The Kingdom are back too, and with some attitude (a Rocker's attitude !). 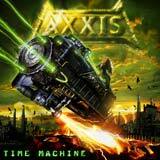 If you like Rock with today's Power Metal sound, then Axxis is the answer to your prayers. The songs arrangements are much more complex than ever before, and apparently Axxis' landing on AFM records has been a most welcome change for the band. Let's hope it will stay that way, cause I simply can't wait to hear what is coming next. I won't describe every song, but instead tell you that this album contains no filler songs, there are some moments I could I lived without (like the "Shalom, shalom" part in Wind In The Night), and I would preferred more speedy songs and a little less ballads / mid-tempos (especially the rather cheesy Dance In The Starlight that must be the song I could have dismissed from this otherwise engaging album). But every song is highlighted by very good guitar work, perfect vocals (as always) and they all have something to offer ! A first since the The Big Thrill album. Probably as good as Back To The Kingdom if not better, Time Machine is a great album that proves that Axxis not only still have it, but they can actually deliver some rather new and welcomed epic tunes. And I'm the last one who will complain about that my friends. Amongst killer songs, you'll find the speedy (and moody) Lost In The Darkness, Gimme Your Blood, The Demons Are Calling, and Alive. A song that has the structure and emotional level of a ballad, but is delivered in mid-tempo. The ballad Wings Of Freedom is also really nice, but we're still a bit far from Hold You and Tears Of The Trees (ok, ok, I know those are like some of the best ballads there is, with X-Japan and Scorpions, to name my favorites). The album ends on Don't Drag Me Down, a rather groovy rock song with some really nice catches and, like always with Axxis : a very catchy chorus. Last but not least, Time Machine artwork is, simply put : beautiful ! A startling illustration and a welcome change of look for Axxis, who never really shined in terms of art covers (except for Return Of The Kingdom that was really nicely done too). After their comeback in 2000, Axxis are "again" back in the game, and with style ! Watch out for their tour with Pink Cream 69 who also picked up 2004 to deliver what surely sounds like their best album to date, but that's the subject for another review. In the meantime, I'll go back and listen to Time Machine for the 50th time :) ! Two thumbs up for Axxis.